Chef Rachel Allen will be attending the Legenderry Food Festival. Celebrity chef Rachel Allen has said she is delighted to be attending this year’s Legenderry Food Festival. The two day Festival will take place at Guildhall Square on March 17 and 18 and will form part of the Spring Carnival and St Patrick’s Day festivities in the city. The award winning LegenDerry Food Festival has already established itself as the biggest annual food event in the North West. Rachel Allen is known for her many TV appearances and her family-friendly cook books. The chef is also a firm supporter of the Legenderry event and she will be making her return to the Marquee on Sunday March 18 at 1pm. The events start at 12pm and goes on to 6pm, and Rachel will be providing an opportunity for visitors to pick up on some of the recipes that have made her a household name. Rachel Allen has now opened her own restaurant in Cork, and teaches in the famous Ballymaloe Cookery School. Speaking ahead of her appearance at the Legenderry Food Festival, Rachel said: “When I was asked if I would demonstrate at this year’s event, I jumped at the chance! “This is such a great food festival as it provides an opportunity to showcase local produce as well as local new talent who may not be as well known yet. “It gives them a springboard into the public arena which they may not otherwise secure. “The location is continually developing and is turning into such a vibrant hub for tourists and industry. “The food industry is expanding very quickly as we are now starting to realise the importance of eating well and just feeling better about ourselves, that’s what I aim to bring to the LegenDerry Food Festival event. “I will be providing two demonstrations for the public to experience the importance of eating local produce and just how simple I keep my recipes for everyone to enjoy. “I will be giving hints and tips on what to look out for when cooking that all important meal and on following a simple recipe guide. 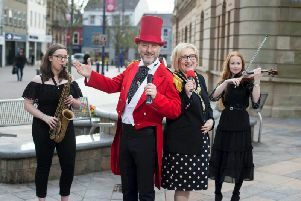 Head of Culture with Derry City and Strabane District Council, Aeidin McCarter, said the Legenderry Food Festival would be a major highlight of the Spring Carnival programme. The LegenDerry programme is supported by Tourism NI and DAERA’s NI Regional Food Programme and organised by Derry and Strabane District Council.